Two Palestinians suspected of the abduction and murder of three Israeli teenagers in June have been killed by Israeli forces, Israel's military says. A spokesman said troops searching for Marwan Qawasmeh and Amer Abu Aisha surrounded a building in the West Bank city of Hebron where they were hiding. "We opened fire, they returned fire and they were killed in the exchange," Lt Col Peter Lerner added. The abduction of the teenagers was a trigger of the recent conflict in Gaza. Col Lerner said the search for Mr Qawasmeh and Mr Abu Aisha had led a special police counter-terrorism unit, Yamam, to a hideout in the Hebron area about a week ago, according to the Associated Press. Early on Tuesday, Israeli forces entered the ground floor of the two-storey building and killed the two men after coming under fire, he added. Initial reports said a rocket and a bulldozer were used in the assault. The Israeli military initially said it had only confirmed that one of the suspects was killed. The other was also believed to be dead, it added, although confirmation would have to wait until his body was recovered. Chief of Staff Lt Gen Benny Gantz said: "We promised the [teenagers'] families that we would find the murderers. This morning, we did just that." "This isn't a consolation for the grieving families," he reiterated, "but I hope that knowing we reached their children's murderers may slightly comfort them." One of Mr Qawasmeh's relatives has already been charged with planning the teenagers' abduction. The militant Islamist group Hamas initially denied being behind the killings but later on its political leader Khaled Meshaal said members had carried them out. "Hamas praises the role martyrs Abu Aisha and Qawasmeh played in chasing down Israeli settlers and we stress that their assassination will not weaken the resistance," Hamas spokesman Sami Abu Zuhri said. 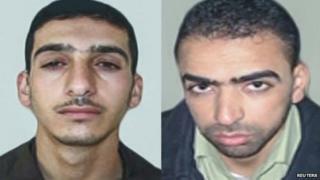 Israel identified Mr Qawasmeh and Mr Abu Aisha as key suspects in the abduction of Naftali Frenkel and Gilad Shaar, both aged 16, and 19-year-old Eyal Yifrach shortly after the went missing at a road junction between Jerusalem and Hebron as they hitchhiked home on 12 June. But for the all the sophistication of Israel's extensive intelligence operations on the West Bank they managed to evade capture for several months, says the BBC's Kevin Connolly in Jerusalem. While they were on the run a tragic pattern of consequences flowed from the abduction, our correspondent adds. Israel launched a crackdown on Hamas in the West Bank following the abduction, detaining hundreds of members. Then on 2 July, a Palestinian teenager from East Jerusalem was abducted and burned alive in an apparent revenge attack two days after the bodies of the Israeli teenagers were found. One Jewish man and two youths have been charged with the murder of Mohammed Abu Khdair, 16. The killings set off an escalating cycle of violence, leading to a 50-day conflict between Israel and Palestinian militants in the Hamas-dominated Gaza Strip that claimed more than 2,000 lives.